Recently I was in Carrick-on-Shannon and stumbled across the most amazing little building. The building in question is a small memorial chapel located at the top of Bridge Street sandwiched between two shop fronts. Costello Chapel: Ireland’s smallest chapel Carrick-on-Shannon. The chapel, a single room building is tiny, measuring circa 4.8m x 3.6m. The chapel, built on the site of a former Methodist chapel, was commissioned in 1877 by a Carrick-on Shannon merchant called Edward Costello as a memorial to his wife Mary Josephine. The building was completed in 1879. The chapel was built of cut limestone with a steep pitched stone roof with two Celtic cross finials at each gable. 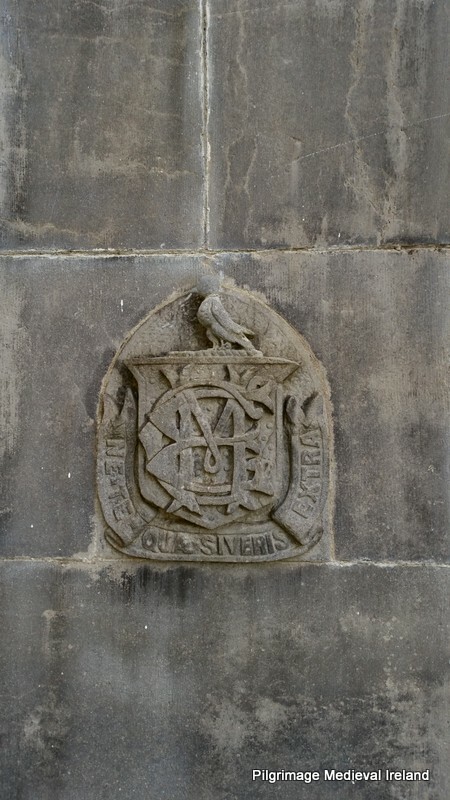 On the left hand side of the door is a carved stone depicting the Costello coat of arms and Latin motto ‘Ne te quaesiveris extra‘ which means ‘Seek not thyself outside thyself’. The chapel is entered through two doors of simple design, made of wrought galvanised iron. 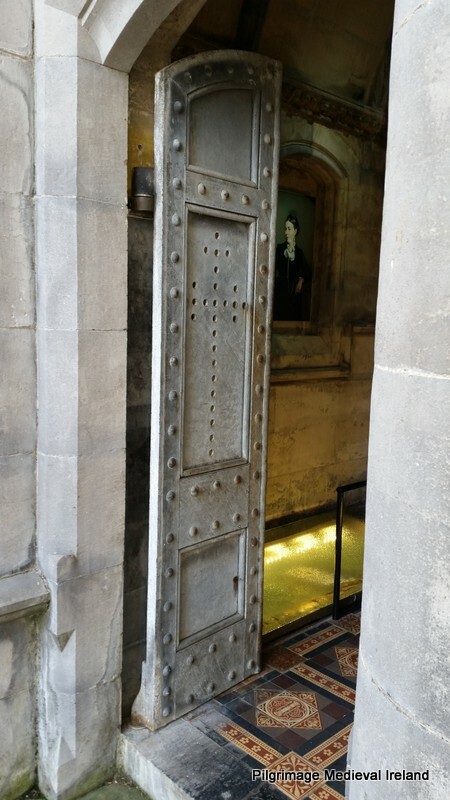 The chapel’s doors are made of wrought galvanised iron. Within the church is a small marble altar and tabernacle. Mass was celebrated here from the time of Mary’s interment in 1879, on the first Friday of every month until Edwards death in 1891. Mary Costello had died in 1877 and her remains were embalmed. When the chapel was completed she was buried within the chapel on the right hand side of the building in a rectangular sunken grave. 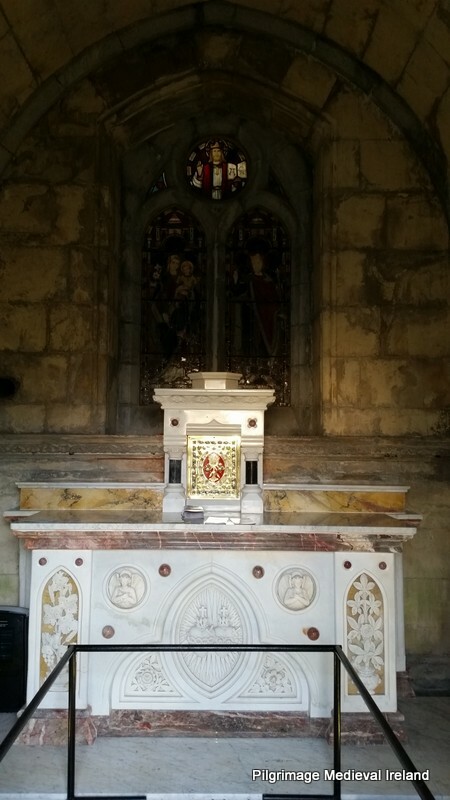 Following Edward’s death he was also buried in the chapel and placed on the left hand side of the chapel. Both graves were sealed by a thick clear glass and when you enter the chapel today the coffins are visible. 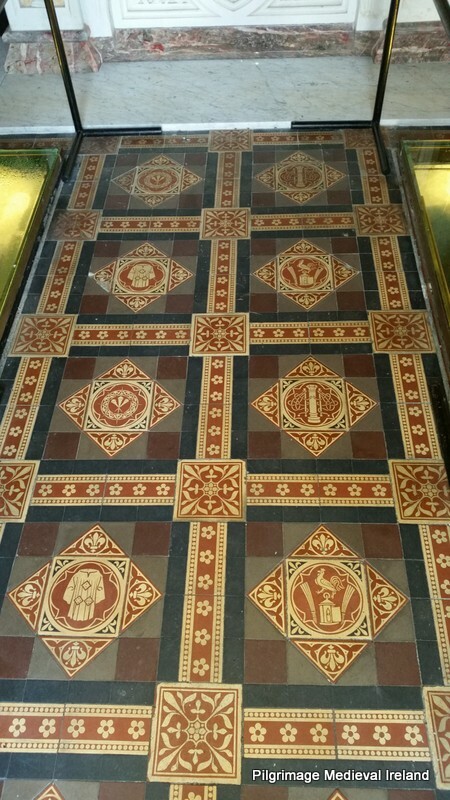 The floor of the chapel was tiled with tiles depicting symbols of the crucifixion. Another lovely feature of the chapel is beautiful stain glass window which the information plaque at the site notes was designed by Mayer of Munich. 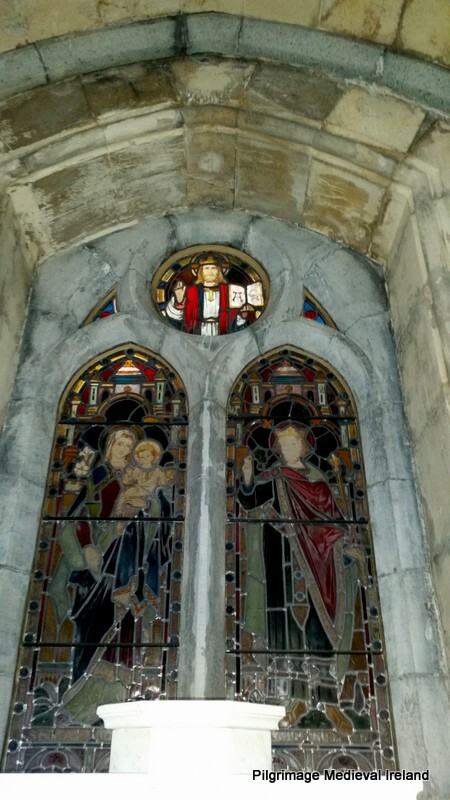 Stain glass window within Costello chapel. The chapel is a beautiful structure and testament to Edward’s devotion to his wife. If you are passing through Carrick-on-Shannon do seek it out and see for yourself. Notice board at the site. 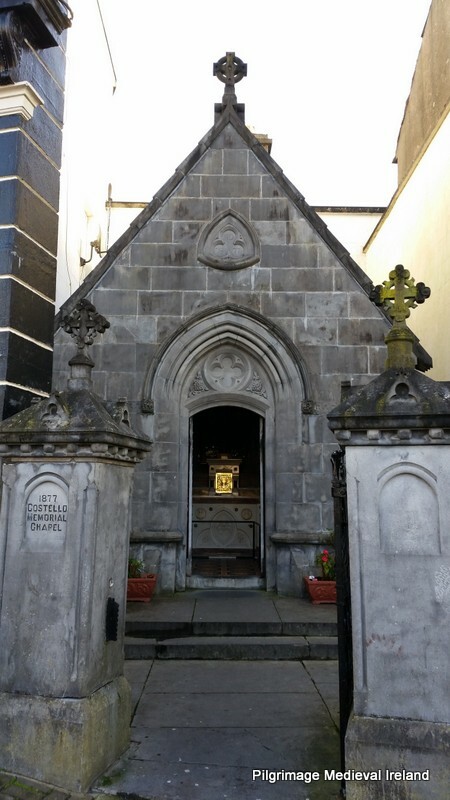 This entry was posted in Uncategorized and tagged Carrick-on-Shannon chapel, Costello Memorial Chapel, Ireland's smallest chapel. Aw, how could you show everything except the coffins!???? They are fascinating. Hi Pamela , the day I visited the glass over the coffins was covered in condensation so you couldnt really see them properly. It a wonderful little church. My Aunt lives in Carrick-On -Shannon and me and my brothers have visited this chapel since we were very young and I am still fascinated by it today. To be able to see the coffins is eerie but wonderful. Well worth a visit.